Translation freaks me out! Don't get me wrong. There are some very fine translators and some exceptional translation firms. Of course there are bozos too, but most of the bad translation that floats around is the clients' fault. It's not up to the translator to understand a company's business - and so if a knucklehead decides to sell his labor saving, cost reducing automation which is well received in high labor cost markets using a "translated" value proposition in Indonesia, he'll fail. International inbound marketing is an incredibly effective business development tool for companies, and it's a great way to ease into exporting sales - but it's not a tactic to be casually explored. It takes experience and guidance from international business consultants to employ effectively. Naturally each market is different - and the way that products fit, buyers perceive them and decisions are made vary widely. It's not the same product after all, companies soon realize as they struggle to grow international sales. I spend a lot of time discussing this with clients, but often just anecdotally. 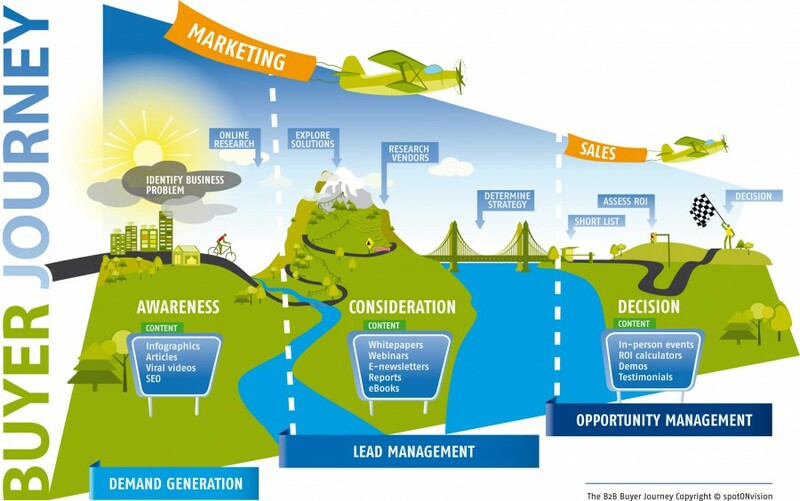 I haven't had a good framework for doing so, and as the great infographic below shows, despite the differences, there are also commonalities in buyer journey across global markets. Now I may have found the framework. I recently read Kristin Zhivago's book Roadmap to Revenue and the light bulb came on. The book was easy to read and the premise is spot on - it very closely parallels the approach I suggest to companies. Essentially selling is dead - companies and people now buy; and today the art of selling is really the art of helping buyers. Kristin's focus is on helping companies artfully mine customer & prospect relationships for detailed information on the buying journey and decision criteria. It seems she's a customer interview expert. All good stuff but not the key point. Kristin works with a variety of company types and therefore has to categorize purchase behaviors in ways I don't (since I focus on mid-sized B2B manufacturing clients which generally have complex products.) She uses a framework of buyer "scrutiny" level which ranges from low (e.g. a candybar) to intense (e.g. an ERP system.) Buyers have different needs and sellers have different sorts of information and reassurance to provide accordingly. She makes the point that companies often struggle when they try to extend a business which sells successfully to one scrutiny level, into another level. They can't quite find the right pace, and don't understand how to satisfy the buyers' needs. As I read it I realized that's precisely where many companies struggle with their international sales. Even if they research the product fit, pricing, features (all the aspects of product localization) and understand the culture and optimal sales channel model, they often fail becuase the scrutiny level (for the same product to the same type of company) is different. Even when they engage international business consultants, the depth of experience may not extend to buying habits. Lot's of folks spend a lot of time in the US and other countries trying to demystify international sales for SMBs. Most potential exporters focus on transactional details, and most resources focus on government programs. But there's a dissonance between the two, and the explanations never seem to explain or justify the hesitancy many companies feel about embarking on an international sales initiative. This merits some research - perhaps those companies which seem to intuitively manage export sales are lucky enough to have a product, in markets, where the buyer scrutiny level (the process by through which buying decisions are made) naturally aligns pretty closely with what they've successfully done at home. Maybe the sense of complexity which some companies feel isn't a function of the international aspects per se, but rather the mismatch in buyers expectations that throws them off. It's an interesting premise to consider for international business consultants, and one which, if valid, could be used to refine the export sales growth process for companies eager to expand. Wondering if it's the right time for you to export? Here's our serious (partially...) guide to picking the right time!